Is set during the period of the 17th Century leading up to the English Civil Wars. Courageous Witchfinders battle against the many vile abominations that plague a once green and pleasant land. Clandestine vampire factions, aided by their loyal Guardsmen of Blind Obedience, secretly strive to gain ultimate power over a deceived nation. Cruel barguests create fear and mayhem across town and country. Evil witchcraft is rife; vicious werewolves savage the innocent and crazed noctelinger hunt in the shadows. This exciting wargame rule book contains 108 A4 sized pages of furious wargaming fun. 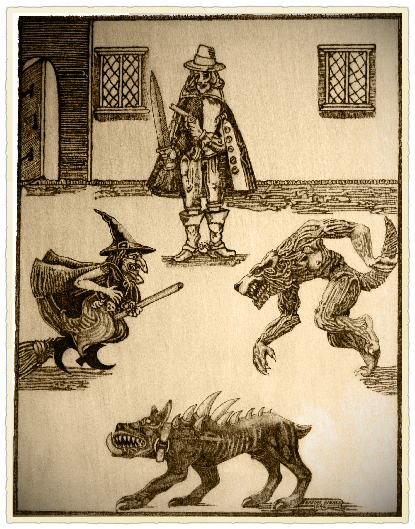 The game is inspired by folklore, myth and the propaganda pamphlets produced by all sides involved in the English Civil Wars. Witchfinder General: Days of Revelation provides background and rules for using: Witchfinders; Angry Villagers; Clubmen; Pikemen; Musketeers; Dragoons; Cavalry; Vampires; Werewolves; Witches; Noctelinger and Barguests. 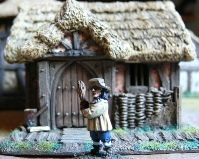 Designed for use with 28mm scale figures. Miniatures on this page made by Warlord Games, Wargames Foundry and Heresy Miniatures. Buildings by Grand Manner. 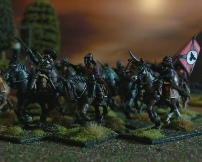 All the figures on this page painted by the author of Witchfinder General. Dashing Dice Games thank these manufacturers for giving permission to use images of their figures on this site..